Right now, dining at the uShaka Marine World’s Cargo Hold Restaurant is “on hold”. 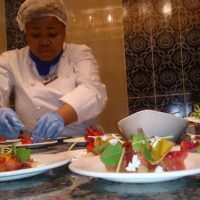 Africa’s favourite culinary ship will be in dry dock from now until mid-September and will hit the water fully decked out for the restaurants culinary voyage around the world launching with a Mediterranean culinary adventure cruise, which will set sail in just over a month. Seafaring foodies can expect a whole new nautical and sophisticated look with contemporary furnishings offset by trendy vintage touches that reflect the Cargo Holds marine theme. Think newly fitted out bar, bench seat dining areas and Cargo Holds famous shark tank where patrons get to dine with the sharks. The captain and his team are preparing a big welcome aboard for this new leg of the Cargo Hold journey with a great dining experience featuring exciting new menus, an award winning wine list, service excellence, and an overall amazing dining experience. While the Cargo Hold drops anchor for its revamp, the Cargo Hold Chef and his team will be getting ready with new menus, wine lists and just continuing to collate a world class dining experience. Cargo Hold also hosts events providing a unique and memorable venue which will be sure to impress any corporate or special celebratory event. Cargo Hold apologises for any inconvenience caused during their revamp. If you wish to enquire or book for the next leg of their culinary voyage in September, you can call 031 328 8065.